Pet Semetary is considered one of His Royal Scariness Stephen King’s most terrifying novels, and one King has said he’d take back if he could due to the subject matter of child death in the book. Both it and its 1989 movie adaptation are classics, so people were both intrigued and a little wary when it was announced that the movie would be getting a remake. Then we got trailers that intrigued us and then made our heads scratch. I don’t need to state spoilers here that the little girl dies instead of the little boy this time, right? Well, too bad. But King was okay with the change, so we had to wait and wonder what the movie would be like when it came out. Based on King’s novel, Pet Semetary revolves around the Creed family, who move into a house in the Maine countryside when father Louis Creed gets a job at a university clinic. He soon finds out that there’s a cemetery for animals on his property, and beyond it another burial ground that has to bring back anything buried in it, including his daughter’s cat. However, sometimes they come back very wrong. When the Creeds are affected by a terrible tragedy, Louis uses the burial ground to reverse the tragedy. But it only leads to an even bigger, more terrifying disaster. There’s plenty to like about this movie. It looks the part of a modern Stephen King movie, and they manage to bring the spirit of the novel, especially the feeling of a domino effect at work with the characters, into it. And for once, Jason Clarke, who plays Louis Creed, actually connects with me as an actor. Normally I don’t like him when I see him in something, but this time I really felt it. Every bit of grief, relief, or horror, resonated with my core. And most of the other principal cast members are great in their roles. Jete Laurence (who’s name, by the way, is a dance move in ballet, which I find fitting given her character’s love of ballet in the film) makes a sympathetic protagonist in particular, and later makes a welcome addition to the pantheon of evil kids out to get us. However, there’s much about this film that left me feeling less than impressed. For one thing, many of the scares were jump scares. And as I’ve become fond of saying lately, jump scares are the cheapest form of terror in horror films. Once they’re done, the fear seeps out of you and you’re okay again. Even after one really effective jump scare, I was okay a minute later. And then there’s the change from the original story: Ellie Creed, the elder Creed child, dies instead of toddler Gage, and ends up being the one resurrected. Hey, I’m cool with it. If there are no surprises, why bother remaking a film? But that’s the only real change that’s worthy of talking about. Afterwards, the film adheres rather closely to the novel, and even where it doesn’t, it’s pretty predictable. I would’ve preferred it if after this change, they decided to make more changes to the story and send it in different directions. I mean, if you’re going to have an older child, rather than a toddler, the source of terror, why not take advantage of that (especially since older children are much better at planning and being devious)? Go where we won’t expect it and give us the terror of not knowing what will happen next! That look, like a raised eyebrow. It says my whole opinion of the film and the decisions made with it in one look. Finally, I felt Jon Lithgow as neighbor Jud Krendall was underused. The character in this film only existed for exposition. In the original novel and the 1989 film, his friendship with Louis feels real. Here, it’s forced in so the character can explain stuff (sans flashbacks too, by the way. I liked the use of those in the original film, why couldn’t they be in this film?). Between this film and Velvet Buzzsaw, I feel sorry for the guy. He’s been in bad roles in two films this year, and neither of them make great horror films. Oh, one more thing: you can tell that cat is a puppet at certain points! It’s painfully obvious! Makes me miss Goose the Cat, who I couldn’t tell was a puppet at several points in Captain Marvel. 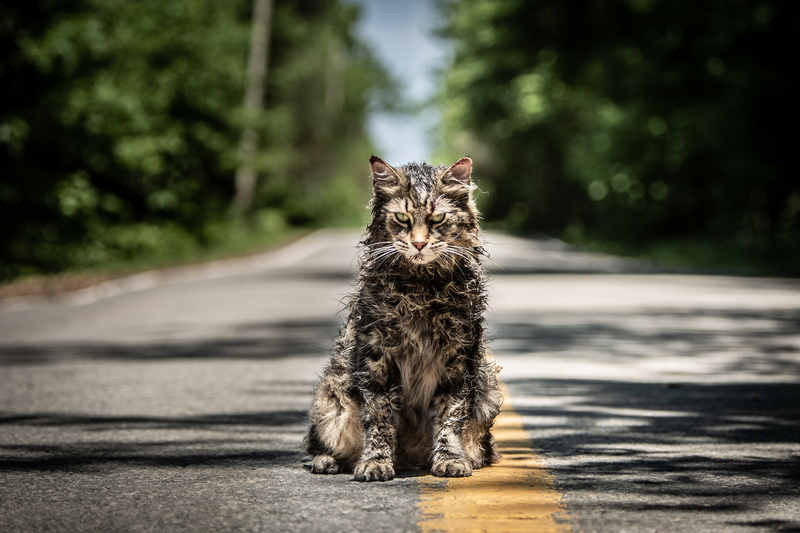 On a scale of 1 to 5, I’m giving 2019’s Pet Semetary a 2 out of 5. Perhaps it’s trying to keep the film under two hours and not alienate Stephen King purists, but in all honesty, I would’ve preferred another twenty minutes or more and some new directions for the story. As it is, the film is going to serve a reminder that not all the adaptations in the current Stephen King renaissance will be gems. *Speaking of which, I’m still looking for advanced readers for my upcoming novel Rose. The story, a fantasy-horror novel, follows a young woman who starts turning into a plant creature (and that’s just the start of her problems). In exchange for an early electronic copy, all I ask is that you consider posting a review on or after the novel’s release date. If you or somebody you know is interested, just send me an email at ramiungar@ramiungarthewriter.com.